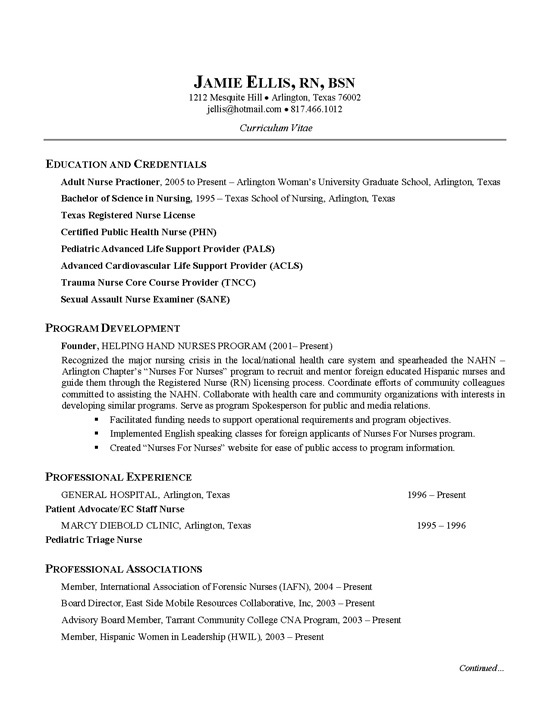 CV Example for Nurse, RN and BSN and Founder of Health Care Organization. This is a good reference CV for anyone in communications, health care or nursing. The beginning of the document lists key education and credentials as a nurse which include RN, BSN, PHN, PALS, ACLS, TNCC and SANE. After the credentials the job seeker list their core experience as a Founder of the nursing program. Responsibilities are found the paragraph with key accomplishments found in the bullet points. The job experience as a nurse is listed, but not of great importance for this individual that is targeting a position in a charity organization as a presenter, speaker or communications manager. The work history is listed below along with affiliations. There are more pages to the CV that can be found in the PDF link below. Created community health care program for educating minority nurses, focused primarily on Hispanic nursing students. Served as spokesperson for public presentations and media relations events. Developed proposals and secured critical funding, donations and grants to support operations and meet the needs of program. Represented group as speaker, presenter and planner at a variety of schools, conferences, organizational meetings and charter events. Received personal letter of recognition from executives of trade magazines. Recognized for success through community service award, nursing excellence award and commitment to leadership award. Published numerous articles on nursing, the nurse licensing process and the idea of nursing being more than a job. Provided community service by working with a variety of related charities. Nurse CV Example By Career Wizards Inc.